In Volume 10 , Buck Denver asks... What's in the Bible DVD includes two 25 minute episodes: The first episode: God's Perfect Timing where the the Old and New Testaments are talked about and how Jesus arrives at the perfect time. All God's plan! The second episode: The Messiah has Come! Children find out why Jesus died for our sins and how he rose again to save us from sin. While the kids are comfy watching Buck Denver it's nice to know we can learn and strengthen our beliefs right along with our children learning about the Bible. I am all for any bible lesson-grown up or children version. Be sure to check out the free activities on the official web site for fun and learning. 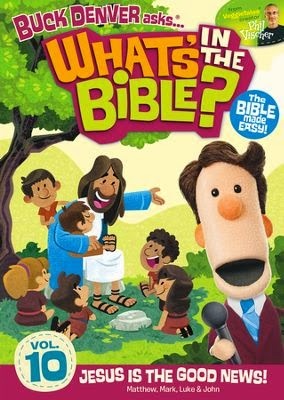 Let VeggieTales creator Phil Vischer and a bunch of hilarious new friends explain the entire Bible to your kids in this groundbreaking fast-paced and fun-filled DVD series. Includes TWO 25 minute episodes: God’s Perfect Timing - Buck Denver and crew learn about the 400 years between the Old and New Testaments and how Jesus arrives at just the perfect time & The Messiah Has Come! - Learn about the life and ministry of Jesus-how He died for us and rose again to launch the kingdom of God in the world and in us! Check out the official website here for ordering DVD's, Books, free activities, newsletter sign up, and special offers. Giveaway: For your chance to win "Buck Denver asks...What's in The Bible volume 10, enter the raffelcopter widget. One winner will be chosen and sent the DVD. Open to residents of USA and Canada. Is that Rafflecopter widget hiding today? Click the link to find it!